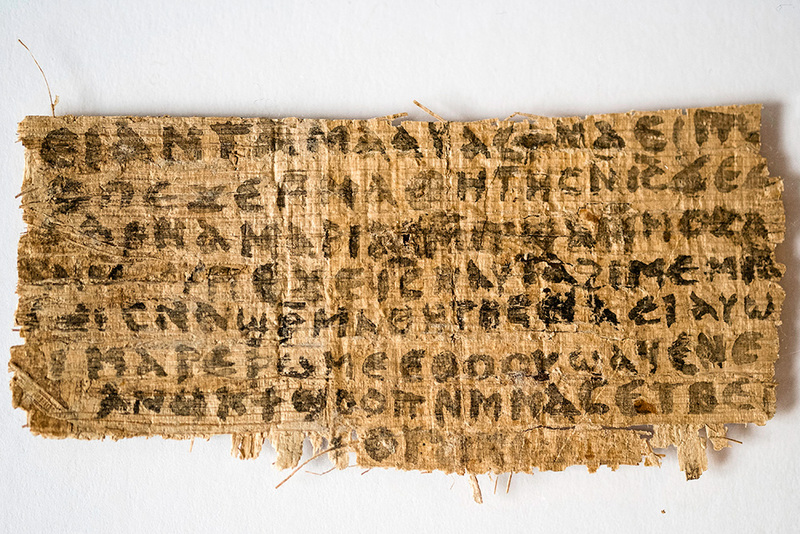 There has been an unbelievable torrent of hoopla over a newly discovered—or rather, recently announced—Coptic fragment that speaks of Jesus as being married. The news of this small, business-card-sized fragment has gone mainstream, so much so that even David Letterman got into the act. On Thursday evening (20 September), just a couple of days after the story broke in the New York Times, he had a telephone interview with the most important guest he’s ever had: Jesus Christ. This ‘Jesus’ was married and his wife was nagging him in the background. Anything for a laugh, it seems. But when the circus leaves town, what have we got? Below are some facts, some probabilities, and some possibilities. 1. Professor Karen King of Harvard Divinity School presented a paper at the International Association of Coptic Studies in Rome on Tuesday, September 18, making public a fragment of papyrus that explicitly claimed that Jesus had a wife. She gained access to this fragment via an anonymous owner who has permitted her to publish the text. 2. The fragment is written in Sahidic Coptic, an ancient language that has roots in the third century CE. Sahidic is the oldest dialect of the Coptic language. 3. Papyrus was used as a medium for writing until the seventh century CE, so if genuine, this fragment must be dated between the third and seventh century CE. 4. It specifically mentions ‘Jesus’ by name twice, and does so in a way that shows that it is Jesus of Nazareth who is in view. This is evident by the fact that the name ‘Jesus’ is written as a nomen sacrum—or sacred name—in the manner of all Greek New Testament manuscripts, as an abbreviation. On the second line on the right and the fourth line down, in the middle of the line, we see what appear to be ‘IC’ in capital letters. These are the letters iota and sigma. There is a line above the letters, indicating a sacred name. This supralinear line indicates that the reader should not interpret this as a word but rather as an abbreviation. This was done for about 15 different words in NT manuscripts, with ‘Jesus’ being one of the earliest words so abbreviated. 5. The fragment is a fairly clean rectangle, with text missing on all four sides. The top of the fragment looks especially clean cut, being almost a straight line. This is rather atypical for ancient papyri and may play a role in how we should view it. 6. Jesus definitely says ‘my wife’ in the fragment. He also says “My mother gave life to me” and “she will be able to be my disciple.” The antecedent of “she” is not clear, but presumably it’s his wife. 7. Although Professor King has dubbed the fragment, The Gospel of Jesus’ Wife, this is intentionally provocative. There is simply not enough material here (eight lines on the recto, a few words visible on the verso) to call it a gospel at all, let alone the gospel of Jesus’ wife! It would be more accurate to call it The Fragment about Jesus’ Relations (so the anonymous comment Posted at the Tyndale House [Cambridge] website, on Wednesday, 19 September 2012), since there is no evidence that it is a gospel and at least two family members are mentioned (Jesus’ wife and Jesus’ mother). 8. The hand is neither literary (done by a professional scribe), nor even documentary. It doesn’t even look like it was penned with a stylus because the writing is so blunt. Rather, it looks like it was brushed on. Parallels to this are not easily forthcoming in Coptic writings of any period. 9. Does this fragment prove that Jesus was married? The answer is an emphatic no. At most, it can only tell us what one group of ‘Christians’ in the middle of the second century thought. But it says nothing about true history, about Jesus of Nazareth. 10. The fragment has similarities with the Gospel of Thomas, which most scholars date to the middle of the second century. Saying 114 is especially similar, as is Saying 101. Saying 101: “My true mother gave me life”; fragment, recto, line 1: “my mother gave me life.” Saying 114: “Simon Peter said to them, ‘Let Mary go out from among us, because women are not worthy of the Life”; fragment, recto, line 3: “Mary is worthy of it.” But what must be kept in mind is that Thomas 114 has Jesus continue: “See, I shall lead her, so that I will make her male, that she too might become a living spirit, resembling you males.” Whatever this means, it is unlikely to be an endorsement of marriage or even of women as women. Gospel of Thomas Saying 114 is, in fact, a politically incorrect statement that none should embrace today as representative of the true Christian faith. 11. The provenance, history, and ownership of the fragment are unknown. This creates a good deal of suspicion on the part of the scholarly community as to the fragment’s authenticity. 13. Although Mary (Magdalene) is mentioned in line 3 and Jesus speaks of ‘my wife’ in line 4, because of the fragmented nature of the MS it cannot be positively determined that Jesus is saying that Mary was his wife. This is an inference and a likely one, but without proof. The proof is in the portions of text that have either not been preserved or, more likely, have been cut out by a modern dealer. Why they were cut out must remain speculative (see below). 1. The fragment’s four edges suggest that it was cut this way in modern times, probably by the dealer of the fragment in order to get more money out of several fragments so cut. This is the conclusion that Roger Bagnall of New York University came to. But it raises the question: Was this fragment cut because of the rest of the text that may have given a context in which the controversial phrase spoke of Jesus’ wife as other than a literal woman? Dirk Jongkind of Cambridge University used this analogy as a possibility: “We all have our favourite examples of the enticing brochures advertising our perfect holiday homes, which fortuitously manage to miss the oil refinery on the horizon, the overhead power lines, or the motorway at the back of the property. Here we have a fragment which has been deliberately altered, ‘most likely’ by a modern dealer seeking to maximize profit, who gets rid of ‘something.’ And this ‘something’ might well be in the same league as the oil refinery—it might be a spoiler that affected the value of this fragment negatively. The fragment may have been torn in the shape it is now in order to coax the reader into a certain interpretation” (Posted at the evangelical textual criticism website on Thursday, 20 September 2012). 2. The date assigned to it—fourth century—is largely an educated guess. Coptic manuscripts are notoriously difficult to date. Roger Bagnall of New York University and AnneMarie Luijendijk (pronounced ‘Lion Dike’) of Princeton University have argued for its authenticity and date. Scott Carroll of Oxford University dates it to the first half of the fifth century—if it’s genuine at all. There has been talk about using Carbon-14 to date the fragment more accurately, but since this would destroy some of the text it has been discouraged. However, there is a relatively new method for dating manuscripts that is non-destructive. I did not see any discussion of this in the reports. Developed by Dr. Marvin Rowe of Texas A & M University and his doctoral assistant, Professor Karen Steelman, the method uses a plasma chamber that does not damage the artifact. (See Marvin W. Rowe and Karen L. Steelman, “Non-destructive 14C Dating: Plasma-Chemistry and Supercritical Fluid Extraction,” March 2010, ACS National Meeting 2010.) So it would indeed be possible to get a firm date on this fragment without destroying any text. It would be interesting to see if Professor King and the anonymous owner would permit this method for getting a better fix on the date and especially to dispel any suggestions of its inauthenticity. 3. Karen King has said that although the fragment is from the fourth century, the text is most likely from the middle of the second century, on the basis of similar ideas floating around in Gnostic and other texts. But this is difficult to assess, especially since almost no context is given for Jesus’ words, and nothing is known about the fragment’s provenance or what other manuscripts were found with it. 1. This manuscript is a fake. Dr. Christian Askeland, in attendance at the International Association of Coptic Studies conference in Rome, noted that about two thirds of those in attendance were very skeptical of its authenticity, while one third were “essentially convinced that the fragment is a fake.” Askeland said he did not meet anyone at the conference who thought it was authentic (posted at the evangelical textual criticism website on Wednesday, 19 September 2012). This presumably does not include Professor King. A number of noted coptologists have pronounced it a fake or have expressed strong reservations, including Alin Suciu of the University of Hamburg, Stephen Emmel of the University of Münster, Wolf-Peter Funk of l’Université Laval in Quebec, Hany Sadak the director general of the Coptic Museum in Cairo, Scott Carroll, Senior Scholar at the Oxford Manuscript Research Group, and David Gill of the University of Suffolk. 2. If genuine, the text is either (a) not Gnostic (since it contradicts the basic Gnostic view of the material world); (b) Gnostic though with an interpretation of marriage as other than the physical bond between a man and a woman (in the Gospel of Philip “the relationship between Jesus and Mary [Magdalene] is an allegory of the soul’s meeting with God in the bridal chamber, i.e. salvation” ; similarly, the Gospel of Mary [Simon Gathercole of Cambridge University, interviewed on the Tyndale House [Cambridge] website, on Wednesday, 19 September 2012]); (c) orthodox but metaphorically referring to the church as the wife of Jesus (a view already attested in the New Testament—implicit in Eph 5.23–27 and explicit in Rev 19.7); (d) a derivative Christian group that gave some push-back against the growing asceticism of the orthodox in the late second century, when marriage was somewhat frowned upon; or (e) parabolic or metaphorical with some other referent in mind. 3. Even Professor King did not suggest that this fragment means that Jesus had a wife (and she is not known for her conservative views! ): “its possible date of composition in the second half of the second century argues against its value as evidence for the life of the historical Jesus.” If it goes back to a second-century tradition, we must keep in mind that there is a world of difference between first-century, apostolic Christianity and the various spin-off groups that rose after that early period. Reported by the New York Times, Professor Karen King of Harvard University has unveiled a fourth-century Sahidic Coptic fragment in which Jesus speaks of “my wife”: http://www.nytimes.com/2012/09/19/us/historian-says-piece-of-papyrus-refers-to-jesus-wife.html?_r=2. Let the debates begin!